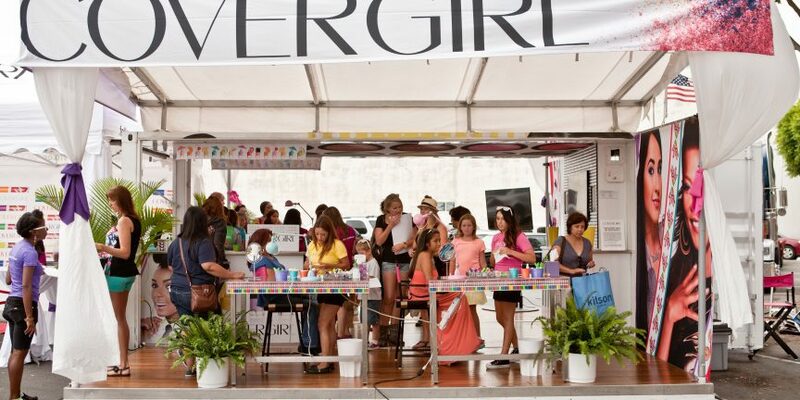 Covergirl wanted to get face-to-face with their core target audience by travelling to major metropolitan areas and popular events across the US, so they called G7 Entertainment Marketing, who called us. 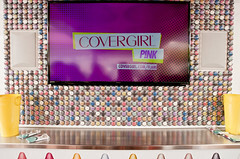 It was important for us to create a space for Covergirl that could travel well and setup/breakdown in high-traffic areas, but also have an ample footprint to allow for product sampling and interactive experiences. 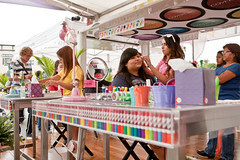 As part of a summer campaign, Covergirl wanted to create a marketing tour that integrated with their #EasyBreezySummer digital campaign. 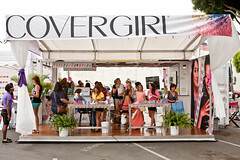 Starting with our standard 20-foot Suite model, the Covergirl unit screams beauty inside and out. 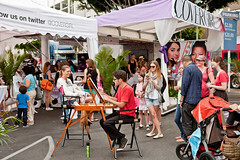 Acting as a moving billboard while en route between stops, our container solution unfolds into the ultimate Covergirl experience upon arrival at a location. 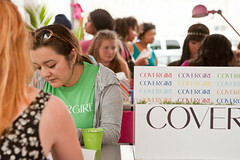 Along with a supplemental tented area, which easily attaches to the unit, the Covergirl team uses the custom environment to set up product sampling and demos for their new summer line. 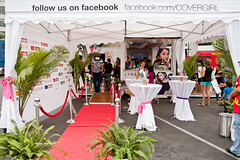 The core idea for our solution was to command attention and then give the Covergirl beauty experts an inviting environment to provide free makeovers, manicures, and beauty tips while their audience did the talking for them via their social media streams. Although the tour is still underway, the results have been overwhelmingly positive. 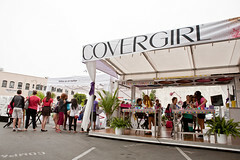 And it’s pretty easy to spot the Covergirl team at an event – just look for the lines of people waiting to get in. Special thanks to G7 for inviting us to be part of this amazing activation.